Yes, I've got it. I'd stare in envy at the milk coming out of mothers pumping it out in the breastfeeding room at the hospital. The lot of them filling up 6-8 oz at a time, some of them the color of ripe mango shakes. Talk about colostrum overload. While I struggle to produce 1 measly oz of milk for my baby. Sigh. I obviously have issues. I've tried everything to increase my production -- natalac tablets,drinking more than 3 liters of water everyday, trying to eat right. Heck, I'm even taking anti vomiting tablets because the pediatrician told me one of the side effects is increased lactation. Lucia's just not getting enough judging by her grunts of frustration when she's been at my breast for some time. I can tell. And I feel so guilty for not being to provide enough for her. So despite my best intentions of pure breastfeeding for Lucia, I've caved in to giving formula. I don't think it's evil like a lot of pediatricians do (thank goodness mine doesn't). I just believe in the good effects of breastmilk. I still put Lucia to my breast first before giving her breastmilk. It makes me feel a lot better plus it keeps my meager supply running, so to speak. I resign myself to the fact that I will never be able to pump like those mothers do. I'm just glad that Lucia continues to thrive and gain weight. Now excuse me while I go take my Plasil tablets. I wish I could carry her in a sling all the time since it frees my hands but it's just too hot at home. This is only possible at the mall or restaurant but since we've refrained from going out with her (too scared of the swine flu that's going around), I've only been able to carry her this way a couple of times. Mostly to restaurants that are stand alone and not crowded and never at the mall. I've got a slew of pictures we took at lunch yesterday (my dad's birthday) but I don't have them all in my laptop yet. Maybe next time. Finally got around to posting some pics of my baby Lucia. Not everyone knows (at least, those who aren't in hubby's facebook circle) what happened during the birth. Placental abruption (also known as abruptio placentae) is an obstetric catastrophe (complication of pregnancy), wherein the placental lining has separated from the uterus of themother. It is the most common cause of late pregnancy bleeding. In humans, it refers to the abnormal separation after 20 weeks of gestation and prior to birth. It occurs in 1% of pregnanciesworld wide with a fetal mortality rate of 20-40% depending on the degree of separation. Placental abruption is also a significant contributor to maternal mortality. It was a very scary moment -- they couldn't find Lucia's heartbeat while I was writhing in pain at the delivery room. As a result of this, her Apgar score was only 3 and she hardly breathed when they finally got her out. 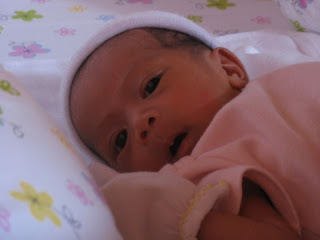 She had to stay in the Neonatal ICU (NICU) for 10 days before she was well enough to come home. There were other conditions that she was being treated for but I don't really want to go into all that. Suffice it to say that we are very thankful that she (and I!) survived the trauma and what could have been a very tragic event had a happy ending. 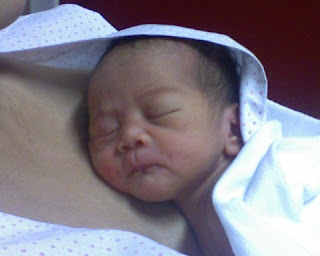 Here's one taken at the NICU while doing kangaroo care. I loved kangaroo care. Taken at home -- around 3-4 weeks old. Yes, I've given birth and there's a story to it (not a very happy one) with a good outcome, thank goodness. But, between changing diapers and feeding Lucia, I hardly have time to really sit down and put it all in writing. So thank you to all the well wishers and please know that I really appreciate your kind words (in this blog and in Facebook and emails and text messages). I will try to update when I have had more sleep, when Lucia loses a bit of her pre-occupation with me (and my breasts) and when I have more time than the bathroom breaks I allow myself due to necessity. - Why doesn't anyone make strapless nursing bras?? Why? Why? Why? - Why do nursing bras have to be so darned ugly? Isn't it enough that you have a post pregnancy belly to deal with? And now you can't even have decent underwear. - Babies poop a lot, I get it. But why does Lucia have to do it in the middle of a feed? Every.single.time. And hey, people don't really need to sleep. I know, cause I'm still alive aren't I?